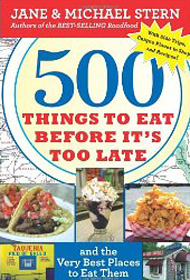 The book 500 Things to Eat Before it’s Too Late by Jane and Michael Stern (they used to write the Road Food column for Gourmet) has become my road trip bible. They ate their way around the most iconic and treasured local diners, bakeries and mom-and-pop eateries around the U.S., and documented 500 of their favorite, mapping them out and writing the up. Every trip I take, or even tootling around New Jersey where I live now, I make sure this book is stowed away in my handbag, ready to whip out to identify what “need-to-eat” item might be in the area. So, when my new husband and I decided to set out on a New England road trip for our honeymoon, I consulted this book and found out that we were headed into ice cream paradise. 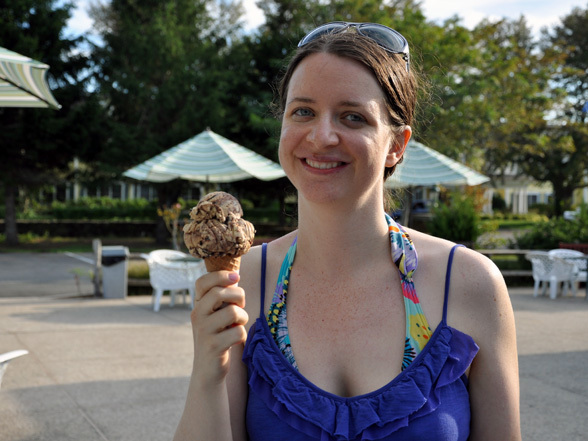 I’ve never thought of myself as an ice cream lover – I’m more likely to crave jelly doughnuts or chocolate chip cookies – but maybe that’s because I didn’t grow up eating New England-style ice cream. They take their ice cream seriously – according to 500 Things, people in the region consume twice as much ice cream per capita as anywhere else, and cute little ice cream shops are everywhere. Geoff and I didn’t waste any time; Once we hit New England we made a point of eating ice cream at least once a day. It was consistently creamy and rich and amazing, but we made sure to stop at Sundae School in Dennisport, Mass., the one shop on our route that was recommended by 500 Things. I chose the flavor Bass River Mud, a combo of coffee ice cream with chocolate mix-ins, so flavorful and decadent that it ranks right up there among the best ice creams I’ve ever eaten. It was ice cream paradise at it’s greatest, with the added bonus that I was able to check one more of the 500 things off my “to eat” list.